With working with passive transceiver and active transmitters allow signals transmission up to 200m and 400m respectively. Save project wire expenses. 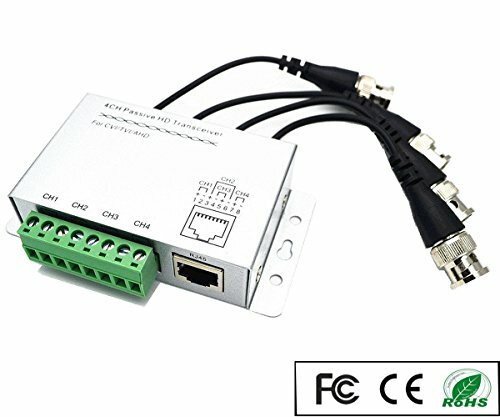 Each a pair of twisted pair wire transmits one channel of video signal and one common Cat-5 unshielded twisted pair wire can simultaneously transmit four channels of video signal. The transceiver is not waterproof set,so keeping transceiver away wet environment will be prefer. Link cable is recommended to use high quality UTP cable. Poor quality cable or network connection or improper construction will cause unstable connection,video or sound disruptions,picture noise appears. Package Content : 1 x 4CH Passive HD Transceiver ; 1 x Manual;OdiySurveil(TM) Brand product with the best quality and more efficient signal transmission,do not compare with those junk materials.